Microsoft has hit back at Kogan over its ‘Internet Explorer 7 tax’ stunt of last month, according to the outspoken boss of the online retailer, removing it from Bing’s search results. 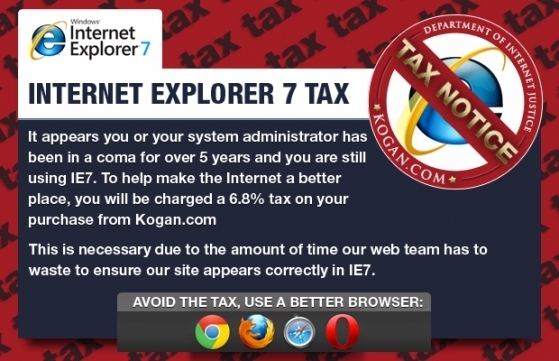 Kogan punished users of IE7, imposing a tax of 6.8% on transactions made via what it described as an “antiquated” and “obsolete” browser. The tax added 0.1% for every month since IE7 was released, to recoup the cost of optimising the company’s website for the browser. In a blog post, CEO and founder Ruslan Kogan wrote that the tax was not an attack on Microsoft, but rather a simple encouragement for people to upgrade their browsers. “We never waged war against Microsoft over IE7, we simply wanted people to upgrade their web browsers – we even mentioned many times in the media how the latest versions of Internet Explorer comply with the latest web standards and are suitable browsers,” he wrote. “We were baffled and shocked to learn that in the aftermath of introducing the IE7 tax, our website stopped appearing in search results in Bing, Yahoo and other search engines in the Microsoft Network. A quick Bing search will deliver search results for Kogan’s Wikipedia page, Facebook and Twitter, but the official Kogan.com is nowhere to be seen.